REMO PowerMax Pipeband is designed for optimum tone control, attack and projection. This head features a free-floating dampening system. 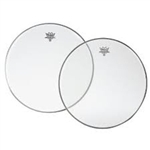 Aquarian Super-Kick Tenor Head 16"
Aquarian Super-Kick clear head 16" with black and white ring dampening. Aquarian Super-Kick Tenor Head 18"
Aquarian Super-Kick clear head 18" with black and white ring dampening. Aquarian Articulator 14" with a white dampening ring. The Articulator comes with a Gloss White, Clear or Gloss Black Finish. We offer this head in all sizes, so if you do not see the size you are looking for, please contact us for custom or sizes not listed. Aquarian Articulator 15" with a white dampening ring. This head is available in Gloss White, Clear or Gloss Black Finish. If you don't see the size you are looking for, please contact us.